Every day we have different mental experiences. We are in a good mood or a bad mood. We are happy or unhappy. These thoughts are always working on us. These experiences are natural, but it is important to understand their nature. They arise, abide, and cease, continually and seemingly without end. We must understand the origins of our thoughts. To accomplish this, we should practice Calm Abiding and Insight Meditation. As part of one’s meditation, posture should be considered. When we sit up straight, our psychic channels open up and stabilize our mental state; it helps to straighten our mind, and improves the breathing. Analyzing the function and nature of the mind, and observing how thoughts, emotions, and feelings arise for a moment, cease, and then change into another thought or feeling is very beneficial for pacifying the mental sufferings. In Calm Abiding meditation, as we observe our thoughts, the number of thoughts decreases until we can naturally experience calm, abiding peace and happiness. When we examine the mind, we notice that it has no color, shape or size. As much as we look, the “mind” or “I” cannot be found. The conclusion is that the mind is empty of a singular or plural nature. We practice Buddhism through different levels of teachings including the Sutra and Tantra. The Sutric teachings are known as the outer or exoteric teachings, while the Tantric teachings are referred to as the inner or secret teachings. In the Sutra (Mahayana) level of teachings, one must practice The Six Perfections including generosity, moral behavior, patience, diligence, meditation, and wisdom. In Tantra (Vajrayana), the individual meditates on a particular deity. Meditating on deities helps us to alleviate our physical suffering. Our active minds cause us to have mental discomfort. Impure visions occur when we have clinging or grasping or attachment to the activities of Samsara. This clinging and grasping acts like a burden, dragging us down, and it makes our mind heavy. If we have a pure vision, we are free of these attachments and our consciousness, our spirit, rises. Motivation plays a very important role in our practice and has a connection to pure and impure visions. Impure vision and pure vision are very much connected to our motivation. If we have a pure motivation for doing the practice, then we will naturally have a pure vision or pure attitude. With a pure motivation, we do not have clinging or attachment providing a solid foundation for our practice. Likewise, if our motivation is wrapped up with our worldly concerns, which are naturally connected with our attachments (clinging and grasping), our practice will be characterized by an impure vision. It is very important to practice mindfulness techniques. For those spiritual practitioners who are interested in detailed instructions on some of the mindfulness techniques covered in this article, I refer you to The Three Visions by Ngorchen Konchog Lhundrub and also to The Three Levels of Spiritual Perception by Deshung Rinpoche. 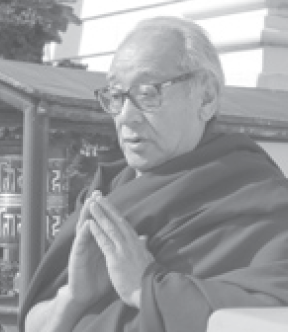 Jessica Bard transcribed and edited Dagchen Rinpoche’s teachings used in this article.